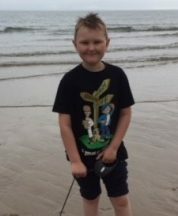 Interests - **PLEASE DO NOT SEND SUGARY SWEETS** Lewis enjoys swimming when he is well enough, Minecraft, Lego, Roblox, gaming. 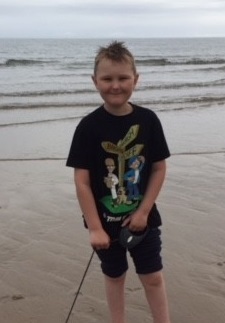 Lewis loves school, he loves all animals, especially dogs and wants to get a pug when his treatment is finished (March 2019)Lewis loves knowledge and pics of animals, dinosaurs, pigs and dogs but any unusual animal too. Lewis was diagnosed with acute lymphoblastic leukaemia in November 2015, he was six years old. Lewis had collapsed at home and was taken to our local hospital where a simple blood test revealed he had cancer of the blood. From there, he and his family were taken by ambulance to the Leeds General Infirmary paediatric oncology unit. Treatment began straight away and a once lively and vocal Lewis quickly turned into a bed bound, tired and poorly little lad. He needed lots of red blood cell transfusions and platelets to support him as the chemotherapy destroyed his bone marrow so his cancer would too be destroyed. There were many side effects to this initial stage of treatment – dexamethasone (a steroid) gave him diabetes which required finger pricks three to four times daily and an injection of insulin to his stomach. Another chemo drug caused a thrombus in Lewis’ popliteal artery from which he still is unable to walk on his left leg. There was also the daily Tinzaparin injections to thin his blood to cure the thrombus which Lewis found very painful. Something called a port was implanted into Lewis’ chest so blood samples could be taken more easily and the intravenous chemo given. This got infected. Lewis had a nasty infection to fight off over the next two weeks while having chemo. Lewis missed his seventh birthday and Christmas as he was an inpatient for eight weeks. Battling on, Lewis attended school in his wheelchair with a sick bowl close to hand. The first eight months have been hard for him with numerous re-admissions for infections. In the future, Lewis wants to meet Dan TDM, have hair and be able to run. At the end of treatment (March 2019) Lewis wants a pug puppy. I will let another poorly child have the benefit of post pals. Lewis has enjoyed it so much and as a family the love and support has been very much needed. Lewis Brian is still on treatment for some time but attends school and gets more social interaction outside the home now. Lewis has been a little poorly due to an increase in his chemotherapy to cure his leukemia. His school trip and parents evening were ruined as he was vomiting lots and so he was admitted to hospital. Lewis is using a splint for his left leg but he manages unsupported by crutches now and only uses a wheelchair when the drugs get the better of him. He still wants to run and play tag with his friends. The Physio team are working on this. His hair has grown back and now Lewis even goes to the hairdressers! Lewis has learned to take a tablet too and eats well so his nasal tube was removed. The plan is that Lewis will finish his chemotherapy in march 2019. Lewis loves knowledge and pics of animals, dinosaurs, pigs and dogs but any unusual animal too. Though Lewis is so very grateful for all his gifts and posts could you kind people not include sugary sweets. Any dental problems could be a headache to treat. Lewis has two years left of leukaemia treatment and is still lame in one leg after early side effects to chemotherapy gave him a blood clot. He struggles with normality due to the drugs but loves school and attends as much as he is able to. Lewis loves to swim but can only do so if his bug-fighting cells are good enough. He wants to be able to run again. Lewis likes all animals and info pictures, etc, about them. Lewis likes DanTDM and had a wish come true to meet him earlier this year. Lewis likes Roblox and Star Wars, too. His favourite animals are pugs and he hopes to have a Chug (Chihuahua x pug) one day.